Ross G. R. Caldwell wrote: I don't think there is a narrative, Marco. There is just a group to be memorized, that iconographically makes sense, because the iconography provides the information about the hierarchy, not numbers. In the case of these subjects, the term "increasing lights" makes the most sense. I don't think there is any difficulty with it, and no other information is being conveyed. I understand your point of view. A narrative is certainly not necessary to explain the Lightning, Stars, Moon, Sun sequence. But if what Dummett defined as a single group of celestial entities is split into three groups (the Devil, the Hierarchy of Light, the last two "eschatological" triumphs) I am not so sure that the simplification we get on one side (no narratives) compensates the increase of complexity on the other (three groups instead of one). Moreover, I see the second section as a "narrative" in the sense of a chronological sketch of human life. Seeing the third section as a chronological sketch of the afterlife seems to me symmetrical and understandable. Possibly what I lack to fully understand your theory is a clear understanding of how these four "lights" fit the entire design. I’ve never made the order of the trumps central to my argument and thus I need no special pleading due to the order (I do agree someone imposed an order but one that was not self-evident to all or otherwise we wouldn’t have 3 competing orders). ...but to get people to even see that Thunderbolt is the subject of the card, not its dramatic prop, a tower. The lightning is simply not firing up the sky but rather in every instance it is striking a symbol of a city – a tower. 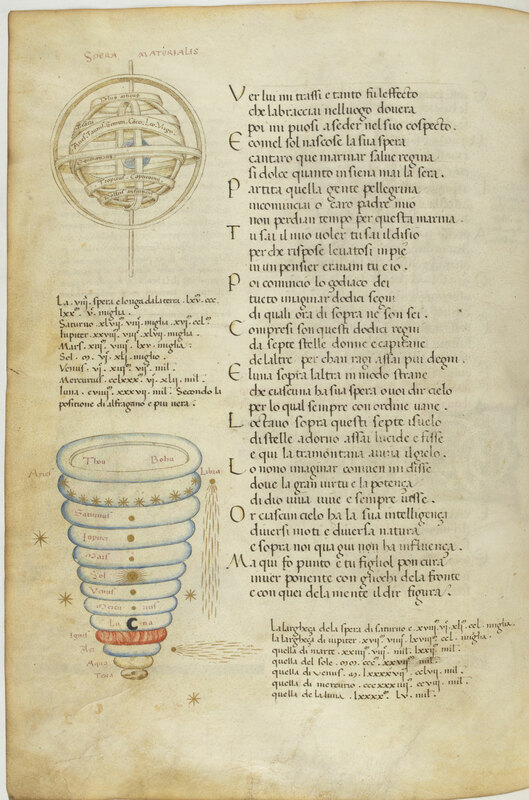 Also the “Marziano Jove” image you posted is almost an exact cognate for the “Mantagna Jupiter”, complete with mandorla framing, and is from Visconti Milan so it need not matter what the provenance of the “Mantagna tarot” is. Moreover, it too strikes humans felled by the wrath of God’s bolts who are now lying about dead (except that the lightning bolt has been replaced by an arrow in the “Mantegna”). What boggles the mind here is that all of the earliest Italian explanations for this card call it SAGITTA - including the two tracts you translated(!) - but you have all but ignored that name (and instead have focused on the much later name of Il fuoco in order to make it fit more neatly into your theory). So why does sagitta indicate fire, but not specifically Jove’s lightning bolts? Ah, another "rectified" Tarot, then. It takes an incredibly perverse reading of what I have written on this subject to claim that I think that the Saetta card means - merely, exclusively, generally, elementally, or whatever - "fire". You even quoted what is a representative statement of my position. Fire - but in the sky. And not the element fire either, which would be orphaned if standing all alone in the sequence. There is no doctrine here, just a stunning iconographical subject, in its appropriate place below the higher celestial "fires". Call them "Jove's" if you like, it wouldn't be anachronistic either. At best it would be merely another colorful name for the subject, which is indeed la saetta (il fulmine). But Jove and his adventures, even simply his place in the Olympic hierarchy, is not the subject of the sequence or any part of it. So "Jove's Thunderbolts" doesn't advance our understanding of the subject and its place in the sequence, and is more likely to mislead than to clarify things. I designed that Jove card, btw, about a decade ago, as a montage of Michelino paintings. The figures on the ground are supposed to be the Titans or Giants whom the Olympians defeated, and referred to in Marziano's text. It has nothing to do with "wrath" per se, it was a war. Those figures come from a painting of the Resurrection, showing the soldiers sleeping at the tomb. I do think Michelino would have painted this card with Jove in medieval style, and I took the E-Series card as my model. Jove's thunderbolts is the subject of the card - God's wrath. For you to dismiss a component of the card - the tower (and often dead people) - as a meaningless prop is the only thing that allows you to ignore this wrath aspect. And the tower is a prop to the degree that there are sometimes other "props" (such Nimrod in the Sola Busca) but all props serve to explain the primary meaning of the card: sinning mankind cut down by a wrathful God. The "fire" is always striking man or his hubris-like creation of a city/tower (obviously taken from the tower of Babylon or Sodom). I never implied the Olympic hierarchy had a place in the tarot - I specifically refered to the planetary aspect of Jupiter and the associated images I posted were of the same. The medieval inconography of the Olympian gods and planetary gods was not always the same, but often there was borrowing; at all events the classicizing movement in the arts to restore the gods - as planets or Olympians - only occured in fits and starts in the second half of the quatttrocento and really didn't get universally purged of their medieval "barbarisms" until the neo-classical period (but you already know this, as I know you've read Seznec, et al). But yes, I do believe the planetary Gods are in the tarot - largely misinterpreted after the PMB by moralizing monks (see the Steele sermon), not the condottieri culture for whoim they created. Phaeded wrote: Jove's thunderbolts is the subject of the card - God's wrath. For you to dismiss a component of the card - the tower (and often dead people) - as a meaningless prop is the only thing that allows you to ignore this wrath aspect. And the tower is a prop to the degree that there are sometimes other "props" (such Nimrod in the Sola Busca) but all props serve to explain the primary meaning of the card: sinning mankind cut down by a wrathful God. The "fire" is always striking man or his hubris-like creation of a city/tower (obviously taken from the tower of Babylon or Sodom). I'll take that as a gloss or moralization on the card, a homily on it, but the sequence doesn't demand it, and the tradition of interpretation doesn't support it (not that this is decisive, but it does show how various interpreters far closer than we are understood it). Nothing forces us to understand the lightning striking a tower as the wrath of God. It's tempting, as you can see from the traces of my own peregrinations on the subject, but it is ultimately a dead end. Phaeded wrote: What boggles the mind here is that all of the earliest Italian explanations for this card call it SAGITTA - including the two tracts you translated(!) - but you have all but ignored that name (and instead have focused on the much later name of Il fuoco in order to make it fit more neatly into your theory). I think that the card is named by the Latin "sagitta" (lower case, black ink, as far as I can tell) only in the Steele Sermon. Which are the "Italian explanations" you are referring to? What exactly is this “tradition of interpretation” if not precisely the earliest interpretation of the card as the arrow? I have clearly shown that the arrow was synonymous with Jupiter’s lightning bolts and that is what was interpreted – that the lightning, also known as arrows, but only in the context of Jupiter’s bolts, were slung at erring man. I’m still awaiting your explanation of how the sagittal/saetta could be interpreted as fire (without the Juptier bolt/arrow gloss)? The other major tradition of interpretation is La Maison Dieu “House of God” – and again, “Jupiter” is the commonly encountered humanist name for God…who once again, is striking his wrath at erring humanity. Otherwise how could House of God possibly indicate fire, divorced from its use in striking humanity? The only dead end is the over-emphasis on SEQUENCE to the detriment of viewing the clear as day meaning of the individual card before you: the fire/lightning is striking humanity. 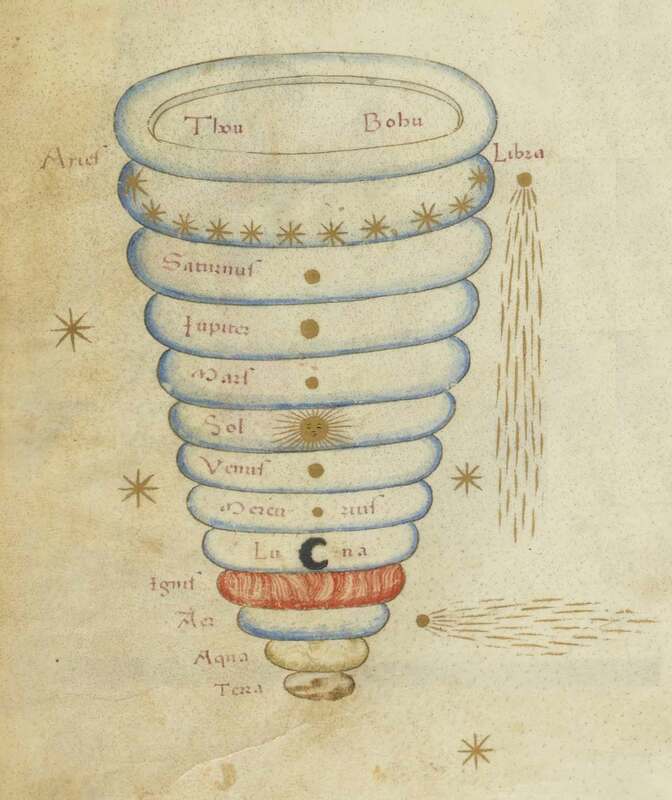 Finally, I’d like to give you my dossier on quattrocento works of art that feature a hierarchy of lightning/star/moon/sun but, alas, they don’t exist. PS Marco – what’s it matter if a tract was written in Italian (saetta) or Latin (sagitta)? They both meant arrow and anyone that would have been behind the tarot program would have known both, including sagitta/Sagittarius. But only the Steele sermon was in the 15th century and closest to the source. Phaeded wrote: Marco – what’s it matter if a tract was written in Italian (saetta) or Latin (sagitta)? Hello Phaeded, to me it does not make a great difference. Since you put so much emphasis on SAGITTA, I thought it was meaningful to you. By the way, you have not answered my question: when you say that "all of the earliest Italian explanations for this card call it SAGITTA" (or saetta?) which sources are you referring to? Phaeded wrote: What exactly is this “tradition of interpretation” if not precisely the earliest interpretation of the card as the arrow? I have clearly shown that the arrow was synonymous with Jupiter’s lightning bolts and that is what was interpreted – that the lightning, also known as arrows, but only in the context of Jupiter’s bolts, were slung at erring man. I’m still awaiting your explanation of how the sagittal/saetta could be interpreted as fire (without the Juptier bolt/arrow gloss)? You know what I'm going to say - that artists added the falling people for dramatic effect, increasing the already dramatic lightning-struck tower. It doesn't matter how florid the decorations of the subject, the subject is still simply one thing - lightning. Focusing on incidental iconography leads you to begin telling a story you can't finish, since the rest of the sequence doesn't work with it. The Star(s) isn't (aren't) falling, the Moon isn't turning to blood, the Sun isn't going dark, it shines on. The inalterable facts we have to work with are that it is between the Devil and the Star, and that it shows lightning. This is all that the designer intended; I think he also wanted it to be striking something, since just having squiggly bright lines isn't very clear, and isn't in keeping with what I think of as the "humanizing" spirit of the iconography (there is always some humanizing context in the iconography, like in the what would otherwise be very abstract World card). 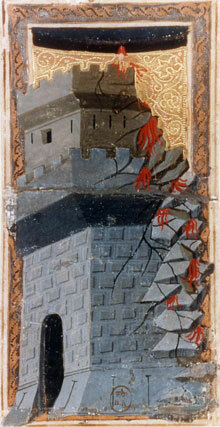 You have to have a tower with falling people for your single-card theory, thereby throwing away those traditions that call it merely "Fulmen" (Alciato) or "Foudre" (Vieville/Belgian), and show it striking a tree, or a person (Mitelli). It's light, in the sky, lower than the star. Since it's not a descriptive cosmograph, a conceptual thing, where the stars should be higher, it can only mean a hierarchy of lights, looking up. It's "homey" (now there's a good word for the "humanizing" spirit I mentioned), not cosmologically technical or religiously dogmatic. It's simple and clear, and it clearly didn't ever confuse anybody, because this order of subjects is never changed. When they said "saetta" to mean "thunderbolt", they no more had to think of Jove/God's bolts thrown in divine wrath than we do when we say the "-bolt" in "thunderbolt". It's just a word, however artists and players and later interpreters might have imagined it. Although it is basically a "strict" cosmograph, what is interesting to me has two things to do with current discussions - one, the "collapse of time and space" aspect, shown by the term "Thou Bohu" (="tohuwabohu", from Genesis 1:2 וְהָאָ֗רֶץ הָיְתָ֥ה תֹ֙הוּ֙ וָבֹ֔הוּ וְחֹ֖שֶׁךְ עַל־פְּנֵ֣י תְהֹ֑ום וְר֣וּחַ אֱלֹהִ֔ים מְרַחֶ֖פֶת עַל־פְּנֵ֥י הַמָּֽיִם׃ ): the end of the universe is identified with its beginning. The other thing is that the artist couldn't resist putting random stars and comets around the cosmograph, which I think demonstrates something else, like a pre-existent experience of wonder, that underlies the ordering of the lights in the trump sequence, independent of any intellectualization of the "correct" ordering. Stars are just all over the place, and smaller and less bright than the Moon. This is the "everyman" experience of the structure of the heavens, as it is reflected in the trump sequence.